Spread your vegetables and tofu onto a baking sheet together and just let it roast. 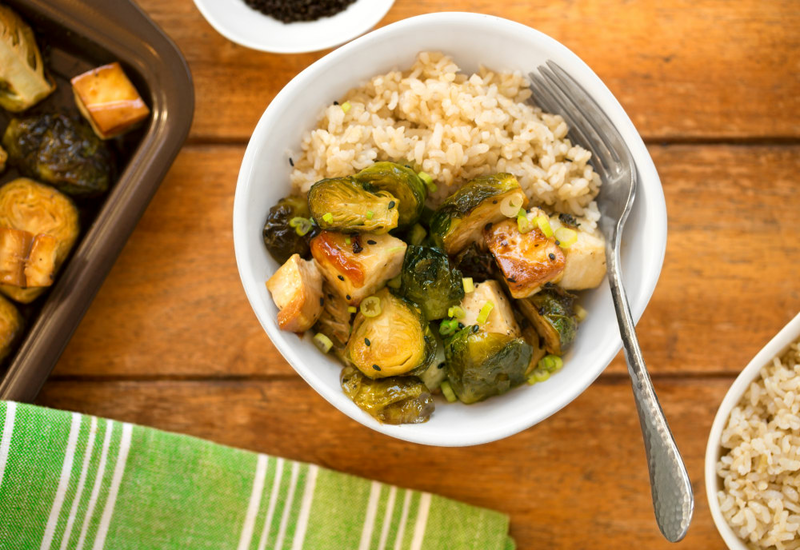 You’ll end up with beautifully burnished, fork-tender Brussels sprouts, crispy cubes of tofu, and a sticky, savory glaze to coat it all. You will love the glaze made with soy sauce, maple syrup, balsamic vinegar, and garlic. In fact, you just might find yourself using it with other protein and vegetable combinations as well! Line your sheet with aluminum foil to make cleaning easier. It's a kitchen hack that will soon become second nature in your home! Per Serving: 227 calories; 7g fat; 37.2g carbohydrates; 6g protein; 0mg cholesterol; 21mg sodium. I made this recipe for my vegan mom and tried some for myself. We both loved it! I really enjoyed the Asian-inspired flavors, and the sauce was fantastic. This is a nice dish for meatless Mondays, and also people who haven't tried tofu. It's easy to make and tastes so good. The balsamic maple glaze was really delicious. It added excellent flavor to the tofu especially, because it's so absorbent. I liked to cook mine until the sprouts were were crispy and a little blackened. Very good recipe. I made this in my cast iron skillet and and added chopped pork belly as well. Love the flavors together, such a great lunch or side when you have friends over. This recipe is a keeper, surprisingly, I wasn’t expecting much but super good, I’ll make it again. Very good & easy! I used corn starch instead of arrowroot powder - works great.